Kathrin Middleton returns to Dexter as Doris Morgan for episode 7.01 "Are You...?" and the flashbacks of the premiere. The last time we saw her on Dexter was few years ago, in episode seven of the second season. btw: Little Deb from the season 1 flashbacks was played by the little sister of the girl who played Rebecca Mitchel. 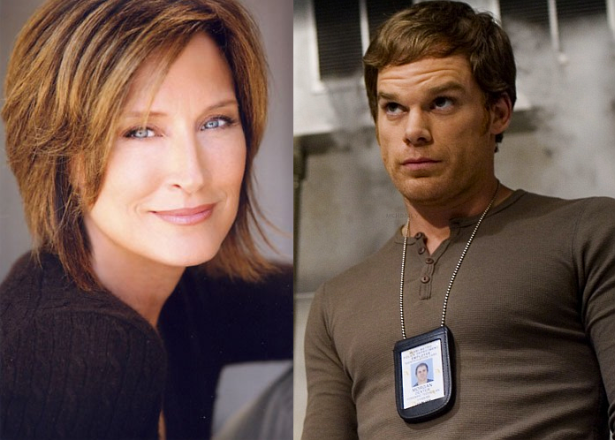 They can bring back Dexter's mom whom we barely care about, but they can't tell us about Astor & Cody!? Who cares about them? I hope they never return. Seasons 1-4 were about Dex, Rita and the kids, seasons 5-8 are about Dex, Deb and Harrison. I don't expect we will ever hear from Astor and Cody again (except maybe for the season 8 finale). I do, for one. I loved Astor's intrusion in Teenage Wasteland, that was an epic episode, what with Dexter's lesson on abdominal anatomy and all. Yes, that's one of my favorite episodes. I don't really need Cody, he's kinda boring. But I miss Astor. They should have kept her. i care about astor and cody, cause dexter always said that he care about astor and cody,,and the first "i love you" was to astor!! I do like Astor & Cody and i think Rita's death was the worst decission the writers ever made. But since they decided to have Rita being killed and to focus on Dex and Deb, it was logical to get rid of Astor & Cody. I think Rita's death was the best thing that could have happened. It had to happen sooner or later and it would have been weird if it had been like last season and then have Deb and Dex hooking up in this one. Now Daokes on the other hand died too soon. They could have figured something out and had him come back for season 5 and completely trashed the whole Lumen storyline. I would agree with the Doakes comment. I dont think Dexter has encountered anyone since that just could not stand him. You hated Doakes when he on there (great acting!). I know he had a lot of the story in S2, but it would of been nice to have him slip through and come back. By season 4 it was clear that Dex couldn't hide his secret for ever. And Deb accepting it makes more sense than Rita accepting it. From that point of view Rita's death and Deb being in love with Dex make sense. If Dex and Deb really hook up in season 7, than what's the point of watching season 1-4? It's like watching Walter White's meeting with Tuko ("This is not meth") after he blew up Gus. Doakes was just great. After he found out there was no other option than his death, but it's still sad he left us after only two seasons. Lumen was my favourite guest star so far (except of course for Brian), but since she left after only one season, they shouldn't have focused on her so much and instead should have started that Dex & Deb in love thing in season 5. I was wondering if it was the same actress as seasons 1 and 2 who would play Doris this time around. I'm glad the same actress agreed to come back. I'm going to love seeing Harry and Doris again. I say that because the Harry we see in season 3-6 is not the real Harry. On a side note, I would like to see Laura Moser again. I can't really see how her return could be justified right now, though. It seems like if she did come back (in visions, obviously), that it would have happened in season 5. Season 5 would have been the best time for her to return. Patrik covered me, spot on.